The earliest Hittite records are dubious. The annals of the half-legendary founder of the state, Hattusilis I, contain what would be the first invasion of Arzawa. This set the tone for centuries of strife. For instance, a treaty of Muwatallis II to Alexandros of Wilusa refers back to it (Beckman p87). However, these annals survive only in much later copies; Arzawa may be an anachronism inserted by a redactor. An 'Arzawiya' appears in the Proclamation of Telipinus, also only extant in later copies. Western Anatolia made its grand debut in the form of the confederacy/rebellion of Assuwa, which a Tudhaliyas mentions fighting in his annals of 1450 BC. Arzawa existed, but there is no evidence that it aided the conspiracy (translation of CTH 142: all CTH translations available via the links on the right, further down the page). Arzawa first acts on its own circa 1430 BC, as an enemy, where it appears in the treaties of the Hittite king, Tudhaliyas II (Beckman p24). Other treaties are quoted in a fascinating internal memo, the Indictment of Madduwattas, by Tudhaliyas' heir, Arnuwandas (Beckman pp153-160 - the 'Indictment' was first assigned to the end of the Hittite kingdom, a mistake that persists to this day in certain places). Lastly, Arnuwandas had written of his father's campaigns in CTH 143 that father and son had attacked Arzawa to the south-west and then campaigned against Masa to the north-west; the latter of which is corroborated in the later Deeds of Suppiluliumas (CTH 40, Bryce p162). I suspect that Masa was across the Hellespont in what became Thrace; and that its people were ancestors to the Phrygians and Armenians [unless Masa is the ancestor of Mysia, in which an Anatolian location is argued in the page covering that kingdom (see sidebar links) - Ed]. According to these sources, Arzawa was ruled by a certain Kupanta-Kurunta. These sources detail the rise to power over Arzawa and the rest of the west by a failed despot over on the Hittite side of the border by the name of Madduwattas. Madduwattas (Madyattes?) faced a struggle in the Lukka Lands (famously lawless) against a 'man from Ahhiya' (Achaia? - [see Ahhiyawa link in sidebar]) named Attarisiyas. Tudhaliyas gave Madduwattas asylum, and even gave him (back?) the mountainous kingdom of Zippasla with the Siyanti River Land; but on condition that Madduwattas use it as a base to invade Arzawa. When Madduwattas did this, Kupanta-Kurunta destroyed his army (again) and occupied Zippasla. Once more Tudhaliyas defeated Madduwattas' enemy and restored Madduwattas to his throne; this portion of the Indictment and its quoted treaty are, I think, corroborated in an event of CTH 143 where Tudhaliyas and Arnuwandas together chased Kupanta-Kurunta out of his land and took his family hostage. And once the imperial family had left, Madduwattas' previous nemesis Attarisiyas attacked him again at Zippasla, with a hundred chariots (famously). This time Madduwattas did not even defend himself, but fled a third time to the Hittites. Tudhaliyas sent a third army under Kisnapili to the land to drive Attarissiyas out. This time, the army was ordered to stay. Madduwattas apparently then decided he was never again going to suffer such indignities. When Dalawa (Lycian Tlawa, classical Tlos) and Hinduwa rebelled, Madduwattas suggested that Kisnapili take Hinduwa while Madduwattas take Dalawa. But while Kisnapili was on his way to Hinduwa, Madduwattas allied with Dalawa, and with its help ambushed and killed Kisnapili. Independent once more, Madduwattas married the Arzawan king's daughter, and soon took that kingdom too. When Tudhaliyas ordered Madduwattas to put down a revolt in Happalla, he did - but then Madduwattas forced Happalla, too, to switch loyalty to his own side. He then bullied Pitassa into his kingdom, even closer to the Hittite heartland. Under Tudhaliyas' hapless successor, Arnuwandas I, Madduwattas even allied with his old foe Attarisiyas and invaded Alasiya (Cyprus). 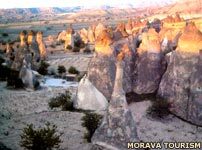 Madduwattas had conquered the whole of western Anatolia. 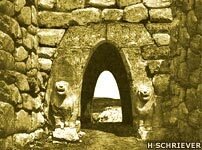 Around this time of Hittite collapse, elsewhere in Anatolia the Kaska burnt down the fort of Masat. Kuniholm's group has tree-ring dated the last building to around 1375 BC, and the destruction layer includes the Late Helladic IIIa style of Greek pottery. 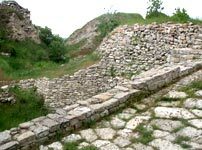 Tarhunta-Radu succeeded Madduwattas around 1350 BC. 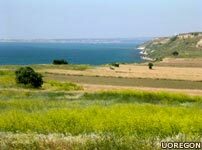 Arzawa by then had made Tuwanuwa - Tyana, a hundred miles to the south of Hattusas - and Uda 'his frontier', and had initiated diplomatic correspondence with Amenhotep III. Tarhunta-Radu even dared request, in Kneshian, for the pharaoh's daughter's hand in marriage. The pharaoh's reply is missing; the god-king probably found it offensive, and either way probably ignored it (Bryce pp140-9). Zippasla disappeared from history after Madduwattas' takeover of Arzawa. The next time the Hittites were able to address the whole of Arzawa, they aimed for Apasas and bypassed Madduwattas' old capital. Around this time, James locates a legendary event which went unmentioned in the records of the now-contracted Hittite imperium: the fall of Mount 'Sipylus' in what would become Lydia, by an earthquake (recorded by Demokles in the 300s BC, and preserved by Strabo I.iii.17 - James p206). The mountain fell into a lake and swamped the kingdom of 'King Tantalos'. Pausanias recorded the same (VII.xxiv.6-7) on the shore of a 'Lake Saloe', as did Pliny the Younger (V.31). In other legends Tantalos was punished by having a rock dangle over his head, proverbial for Archilochos (600s BC, quoted in Pausanias X.xxi.2) and known to the Return of the Atreids (500s BC), Plato (Cratylus 395D-E), and the Scholiast on the Odyssey. Elsewhere Tantalos has to support a mountain (Antoninus Liberalis - Metamorphoses 36). This legend existed in two of what I'd call 'oral recensions': an Ionian Greek cycle concerning the Bearer King Tantalos and/or the kingdom Tantalis; and Plato's 'Egyptian' - in reality, Lydian - version, which had adopted the Greek term Atlantis for the kingdom. James plausibly traced the name and some common aspects of the stories to the 'Tlanz' or 'Tlantes', the Bearer(s), a Greek epithet for Ubelleris and other Hurrian-derived bearing-gods I mentioned above. 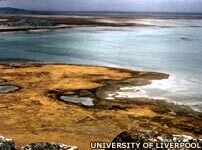 Deducing that other aspects were memories of a prehistoric kingdom, James looked for a mountainous region of western Anatolia with lakes and pre-Greek artefacts. Following the nineteenth century explorers Ramsay and Frazer, he found such a place in the Yarikkaya ravine 'just east of ancient Magnesia', now Manisa (pp252-253). If James were only looking for the Greeks' source for their 'Titan' legends, then so far so good. James did not stop with the prehistoric location, however, but tried to deduce the event as well. Unfortunately there is no contemporary evidence, literary or material, of an earthquake or a flood in this region during the Bronze Age. James was forced to date the event to a gap in the historical record of Arzawa. But these records are Hittite, not Arzawan. The reason the Hittites were unable to reach inner Arzawa at that time is not that Arzawa was too weak, but that it was too strong. James further tried to identify Sipylos (and Sisyphos) with Zippasla, and claimed that the Arzawans had moved their capital from there to Apasas. Leave aside the fact that place names are terrible evidence; even James pointed this out when dismissing the absurdity of planting Atlantis in the Atlantic. More troublesome is that Zippasla was not the founding capital nor was Madduwattas the founding father of Arzawa. Before Madduwattas, Arzawa was outside Zippasla; after Madduwattas, it ignored Zippasla. It is true that Madduwattas' court lived in Zippasla before he took Arzawa, and that later rulers lived elsewhere in Arzawa. There is no need to propose a natural disaster for such a move, but simple military necessity; Arzawa was further away and was also the region's most reliable enemy of the Hittites. So what became of the land of Zippasla? Perhaps the Arzawans struck back and destroyed it. Perhaps a Hittite king punished it. Perhaps Madduwattas or a successor moved his capital on his own. Perhaps the plague of Suppiluliumas claimed it. For now this fruit must remain out of reach. But James had not thought of every potential cause of Arzawan decline and Greek myth. One recurring theme in these Atlantis legends involves rocks from above. In addition to the examples listed previously, Euripides' Orestes ties the much-abused Tantalos to a 'bolos' swinging in orbit around Olympus. This theme cannot be attributed to eruptions (like Thera), nor to earthquakes or floods. Eventually, the Hittites recovered - thanks to the military and administrative geniuses, Tudhaliyas III and his chief advisor Suppiluliumas, later king himself. The Deeds of Suppiluliumas is the primary source here too (CTH 40). Tudhaliyas destroyed the Arzawan fort of Sallapa (which became the Hittite staging post for future campaigns) and re-conquered the Lower Land. He then retook Tuwanuwa. The Arzawan leader Anzapahhadu routed an incursion under the Hittite general Himuili, but succumbed to the next one under Suppiluliumas (Bryce pp163-4). Suppiluliumas's son, Mursilis (KUB XIX 22, another part of CTH 40), mentions as part of his father's reign the Hittite governor Hannutti's reconquest of Hapalla - wrested by Madduwattas so long ago. Later documents say it took Tudhaliyas and Suppiluliumas twenty years to subjugate Arzawa (Bryce pp164-5). It must have been Suppiluliumas who took back Pitassa. Further west, Arzawa's hold seems to have broken, with two cities undergoing internal strife without interference from anyone but the king of Hatti. In the kingdom of Mira in the Arzawa lands (probably the northernmost, bordering Masa and Wilusa), King Maskhuiluwas' brothers besieged him and forced him to flee to Hattusas. One of them had named his heir 'Kupanta-Kurunta' after the Arzawan who had stood up to the Hittites. Suppiluliumas understood this revolt as being dangerous for his frontier. Accordingly he had his daughter Muwatti married to Maskhuiluwas, after which the couple returned to Mira (Beckman p74). Meanwhile, in 'the Seha River Land' (probably just south of Mira), the king Muwa-Walwis ('Lion-Might') ruled as far as Artemis in Lesbos, according to Emory's Anatolian Conference attendee Hugh Mason. But Muwa-Walwis died and bequeathed his throne to Manapa-Tarhunta. The sources imply that M-T, as I will call him, was one of the younger sons of this king. His older brothers plotted in secret. Then a plague struck the heartland of Hatti. Suppiluliumas died of it and his battle-seasoned successor, Arnuwandas II, fell incapacitated - apparently having to share rule with his cunning but underage brother Mursilis. Hatti's enemies began to see their chance, in Seha River and in the Kaska lands of Palhuissa. In the Seha River Land: Manapa-Tarhunta's brothers, led by Ura-Tarhunta, plotted to kill him; but M-T escaped to Karkiya (Caria). Mursilis tried writing to U-T, but U-T dismissed him. Arnuwandas and Mursilis then both wrote to the men of Karkiya to keep M-T safe. U-T meanwhile proved to be both ineffectual and unpopular, as his method of assuming rule presaged (Beckman pp82-3; CTH 61, Year 4). Arnuwandas lived to see a revolt throw out U-T and reinstall M-T; and the old general, Hannutti, marched from the Lower Land upon the Kaska frontier town of Ishupitta. But soon the plague claimed them too. The still-youthful Mursilis II was left alone. During this period, a certain Uhha-Ziti took Arzawa, and the Hittites' Kaska clients Pazzannas and Nunnutas took over Ishupitta. Mursilis did not deal with Arzawa at first. He moved against the Kaska lands, first Ishupitta and then Palhuissa behind it. Next spring he set off from Ankuwa (presumably in that area) into Attarimma, Hu[wa]rsanassa, and Suruda. Their leaders fled to Arzawa. 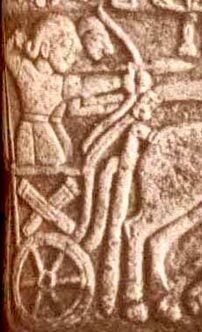 When the Hittite king demanded their extradition, Uhha-Ziti defied him and called him a 'child', bringing along for the ride a Manapa-Tarhunta who clearly felt he owed more to his people than to the Hittites. Then, because the Kaska had rebelled again, Mursilis chased Pazzannas and Nunnutas out of Palhuissa into Kammama; whose citizens put the two fugitives to death. His northern frontier now safe, the king returned to Ankuwa to muster troops. In a campaign well-documented in his Ten Year Annals, the young Mursilis invaded Arzawa. At Mount Lawasa just before he reached the River Sehiriya, Mursilis witnessed a 'thunderbolt' - probably a meteor - streaking from the north-east into Apasas. At Sallapa, Mursilis joined forces with his brother, Sarri-Kusuh, whom their father Suppiluliumas had appointed king of Kargamis (Carchemish, in Syria). At Aura, Maskhuiluwas of Mira informed the king that the meteor had wounded Uhha-Ziti's knee (Bryce thinks, 'brought him to his knees') and incapacitated him. At some point Uhha-Ziti 'stepped after' - allied with - the king of 'Ahhiuwa' (meaning Ahhiyawa). Emboldened by this, Uhha-Ziti's son, Piyama-Kurunta, attacked Maskhuiluwas of Mira, possibly destroying Impa, but Maskhuiluwas fended him off. Maskhuiluwas then turned on Hapanuwa, probably at this time, and allied with Hatti. Mursilis sent Gullas and Mala-Ziti (a Luwian) to raid the Ahhiyawan-allied city of Milawata (Miletos). His father being still incapacitated, Piyama-Kurunta took the field at 'Walma, at the River Astarpa'. He lost. Uhha-Ziti (and both his sons, in context) then fled to the islands just ahead of Mursilis, who walked into Apasas apparently without a fight. The Hursanassan, Surudan, and Attarimman 'deportees' fled to the mountain Arinnandas and to the city Purandas. Mursilis and Sarri-Kusuh successfully starved them out of Arinnandas, but the men of Purandas would not hand over their exiles. While Mursilis was encamped at the river Astarpa, Uhha-Ziti died. Another son of Uhha-Ziti, Tapalazunaulis, returned from the islands and took charge of the army at Purandas. Immediately after the 'Festival of the Year' (presumably their New Year's Eve/Day), Mursilis marched from the Astarpa, drove Tapalazunaulis into the city, and invested it. At this point Tapalazunaulis lost his stomach for warfare and fled with his family and some deportees. Mursilis was able to capture them all but Tapalazunaulis himself. Lacking leadership, Purandas fell swiftly. Piyama-Kurunta at this point finally saw his cause was lost, so he and the king of Ahhiyawa made landfall to sue for peace. Mursilis deported P-K to Hattusas. Mursilis then marched through the Seha River Land, where Manapa-Tarhunta put on an especially obsequious display for the king (Beckman p83). Mursilis left him in charge of the river and of Appawiya. Mursilis then came to Mira. He set up a number of garrisons there, ostensibly to reward Maskhuiluwas for his help against Piyama-Kurunta and to protect him from the people of Mira (whom the Hittites did not trust). He also garrisoned Hapanuwa and gave Maskhuiluwas the land of Kuwaliya. One of the garrisons he built was Impa, which seems to have been a casualty of Piyama-Kurunta's attack. A certain Targasnallis, otherwise unknown, was given Hapalla (Beckman p74) - which had been conquered before the campaign and so presumably had undergone a change during it. Both Targasnallis and M-T stayed there for at least ten more years. Mursilis had subdued the land in two years. For all three kinglets of Mira, Hapalla, and Seha-River, Mursilis signed a treaty recognising them as 'free men' - who of course were now Hittite clients banned from joining together against him. Arzawa proper never recovered, but other western kingdoms may cause some trouble now and again. Maskhuiluwas and Muwatti were not blessed with children. They wrote to Mursilis asking him to recognise their adoption of their nephew Kupanta-Kurunta (Beckman p74). A western king with the Sumerograms &Eacute.GAL.PAP 'fomented revolt' ten years into Mursilis's reign - in context, likely from Masa, which had picked fights on Arzawa's behalf before (Bryce p 231; Beckman p 78). '&Eacute.GAL' in Sumerian is 'great house', usually 'palace'. 'PAP' is a father or a leader. Maskhuiluwas again sent word of this to the king in accordance with Hittite treaty standard. But this time Maskhuiluwas had tired of Hittite support (rather like Madduwattas). He joined &Eacute.GAL.PAP and incited Pitassa into rebellion as well (Beckman p 75). Mursilis returned to Sallapa. When he summoned Maskhuiluwas, Maskhuiluwas fled into Masa while his kingdom Mira-Kuwaliya surrendered. Mursilis invaded Masa, causing much damage. Presumably &Eacute.GAL.PAP was killed in that campaign. Masa's remnant had no choice but to hand over Mira's rebel. Mursilis sent Maskhuiluwas to Hattusas and installed his adopted son Kupanta-Kurunta in his stead. Mursilis's successor, Muwatallis II, told Alexandros of Wiluja that he did not trust the Arzawans (likely with Mira on his mind). At this time, Manapa-Kurunta was ruling over the Seha River. 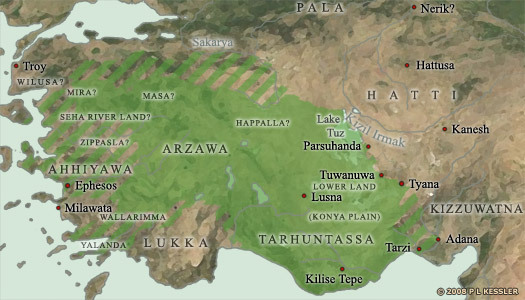 Insofar as Hapalla ever counted as an Arzawa-land, it was now being run by an 'Ura-Hattusa' who must have been Luwian only by name. At Mira, the adopted son of Muwatti sister of Mursilis, Kupanta-Kurunta, was considered a family member of the Great King himself; and so Alexandros was duty-bound to help K-K even against his own people if need be (Beckman p 90). But Muwatallis felt confident enough in Arzawan loyalty to enlist them and their neighbours - including even Masa - as allies against the Egyptians at Kadesh of the Orontes (1285 BC, northern Syria), as recorded by Pharaoh Ramses II [Barnett 1975, 360]. Gurney now considers this the earliest possible time to place the activities surrounding the reinstallation of Walmu of Wilusa (Beckman pp 144-6); Marino dates the event later, to Tudhaliyas IV. When Urhi-Teshub came to the throne of Hatti as Mursilis III, he deposed some of the governors of the old Arzawan states. While this established his firm control over the west (Machiavelli would have approved), such high-handedness did not fly at home. During the ensuing rebellion, Arzawa became Urhi-Teshub's power base, ironically enough supporting the claim of the rightful king. Up until the reign of Tudhaliyas IV (whose inscriptions embellish the mountains of western Asia Minor to this day), Arzawa remained firmly in the Hittite camp. But Marino dates to this time a letter claiming that another 'Tarhuna-Radu' was stirring up trouble in Seha River; KUB XXIII.13. Arzawa appears to have been a victim of the Sea Peoples. 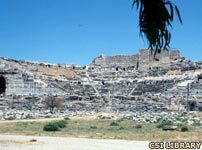 Whereas the cities of central Anatolia were burnt, western Anatolia was abandoned. As a final footnote, the Medinet Habu reliefs of Ramses III contain several scenes of campaigns in Asia during which the pharaoh claimed to have taken 'the town of Arzawa' (as well as Tunip and Amor). Archaeologists agree that these pictures are anachronistic, probably based on Ramses II's monuments. I started non-Biblical history projects like this on 18 February 2001. 24 Feb: used Bryce to flesh out Madduwattas. 28 Feb: split Good James (tracing the legend) from Bad James (locating Atlantis). 22 Oct, improved clarity in places, based on notes taken two months ago and mislaid in my car (sorry!). 9 Mar 2005: I've been meaning to update this for years, for clarity's sake if nothing else; but now I've got some more primary sources so I figured I don't have further excuse for procrastination. 17 May 2005: found map of Purunda and a whole mess o' abstracts, and further decided to look into theophoric names. 9 May 2006: I found copies of the 'Luwian glossary' around the place. The Emory abstracts have been taken offline, so I tagged them as such and moved the master reference to the bibliography. I've consolidated the 'KUB' index numbers with the CTH, and linked them. 19 May: Redirected the Mursilis Annals from http://www.multimania.com/hatti/texts/mursili1-8.html; expanded on the roles of Masa and Sallapa; applied more web-accessible texts; expanded on the role of plague and of the Kaska rebellion on Mursilis I's Arzawa policy. I started the Arzawa page in early 1997 and pretty much ignored it until now, except for 28 June 2000. I don't have the command of nor the access to Hittite that I have of/to Greek, and I've grown addicted to primary sources and text-criticism. Thank you, Ian, for pointing me to your translation; it should have been up here earlier. The letter 's' is pronounced 'sh', 'h' is 'kh', 'z' is 'tz', 'w' may have been intermediary between 'v' and 'w' based on how the Greeks ended up spelling it, and certain '-iya' and '-isa' suffices may be '-izha' based on how names like Karkiya and Karkisa refer to the same place. And the lack of a letter 'o' is a limitation of Sumero-Akkadian cuneiform, not necessarily a feature of Hittite. Note how Hebrew uses the 'w' it inherited from Ugaritic and Egyptian. These are things to keep in mind when considering the strange case of Wilusa Taruisa, now known to have occupied the land we know as Ilios Troia. I have tried to spell the words as if the letter 'h' never existed in English. I could not however resist turning the 'h' into a 'kh' and 's' into 'sh' in places where the 'h' or lack thereof would have caused confusion. I can just about cope with Tudhaliyas. But if I can't spell Pithanas Pitkhanas, Alalah Alalakh, Kanes Kanesh, etc, then I won't be able to pronounce them right. And I don't understand why so many scholars leave off the '-s' nominative suffix. Do we call Julius Juliu? or Sophocles Sophocle? What absurdity. For the near-final word on Hittite history, use Bryce. For the rest of Bronze Age Anatolian culture, use Gurney. It may be dated, so keep an eye out for a new edition. For those who wish Bryce had included illustrations, get-but-don't-read Macqueen, who has little else. The primary sources for Arzawa are Hittite and Egyptian. The Hittites had to put up with these annoying hillmen, so their sources are better. There are four sites with contemporary tablets so far. Kultepe / Kanesh / Nesas is not one of those sites; the only archive there comes from an Assyrian merchant colony within a kingdom that far, far predates Arzawa. Also the sundry hieroglyphic Luwian inscriptions haven't told us much. The most important site is Hattusas/Boghazkale. It was the capital except for a very brief layover in Tarhuntassa, and the texts are relevant. Most of that's been published already. 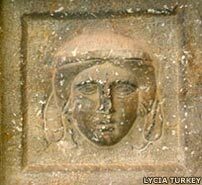 In the 1990s they found Sapinuwa at Ortakoy, a few dozen miles to Hattusas' north-east. These documents are administrative in nature, and have been loudly announced on the web at: http://www.focusmm.com.au/civcty/ortky_00.htm. But they are on the wrong side of the capital for our purposes and (as far as I know) haven't been published. Masat was another Kaska frontier town. Gary Beckman wrote something on the provincial administration there: http://www.umich.edu/~neareast/pages/faculty/beckman.htm. Sarissa has been also found, or at least mentioned, at Kusakli. Its texts are published, too: http://www.vml.de/english/ks/ks1.htm. Unfortunately the building is religious and not political. What they published was the Sarissan edition of 'Goat Sacrificing For Dummies'. Please feel free to send me email via the link on the right. Especially if you have any suggestions concerning this page. And if I'm violating copyright laws, please tell me. Text copyright © David Ross. An original feature for the Arzawa Page and now incorporated into the History Files.